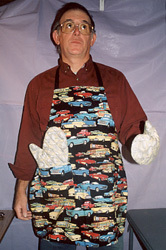 Our adult aprons are made in the traditional bar-b-que style. The aprons are made with a cotton print front and a cotton muslin back. They also have 2 pockets on the front. The aprons slip over the head and tie around the back. Our aprons fit most people in the 5 to 6 foot range. We also make matching oven mitts and chef hats. 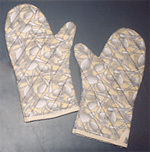 Our oven mitts are available in 2 different sizes. We have the regular size mitts which are large. We also offer a smaller size for those hands that keep falling out of the large ones. We call these our junior size. We have a large variety of cotton prints in stock. If you do not see what you want you may contact us by phone or email. Our oven mitts are all hand made by us and consist of an outer layer of chosen cotton print and three layers of heat resistant material.